TORONTO • There were chants of "M-V-P" showered on Kawhi Leonard on New Year's Day at the Scotiabank Arena, as the Toronto Raptors forward stepped up to the free-throw line with seconds remaining in the game. Soaking up the plaudits, he sank one of two baskets and celebrated the 122-116 National Basketball Association win over the Utah Jazz on Tuesday night with a career-high 45 points and six rebounds. "It's great, because it means they see your hard work, your hard work is paying off and they appreciate what you're doing," Leonard said of hearing the chants. "We made stops on the defensive end, which let us get out in transition and get to our fast-paced offence, and that's pretty much it. "I try to stay in the moment and keep competing every possession and not worry about myself, just try to get a team win." It was also a career-best 14th straight game in which Leonard has scored at least 20 points. Pascal Siakam scored a career-high 28 points as well and grabbed 10 rebounds for the Raptors, who won their second game in a row. With the win, Toronto improved to 28-11, keeping the pressure on the Milwaukee Bucks in the Eastern Conference. The Bucks boosted their league-leading winning percentage to 26-10 with a 121-98 victory over Detroit. The Raptors set a franchise points record in the third quarter, when Kawhi Leonard contributed 19. The Raptors were again without the injured Jonas Valanciunas and Kyle Lowry, whose return date remains uncertain after he received anti-inflammatory injections to combat back pain last week. 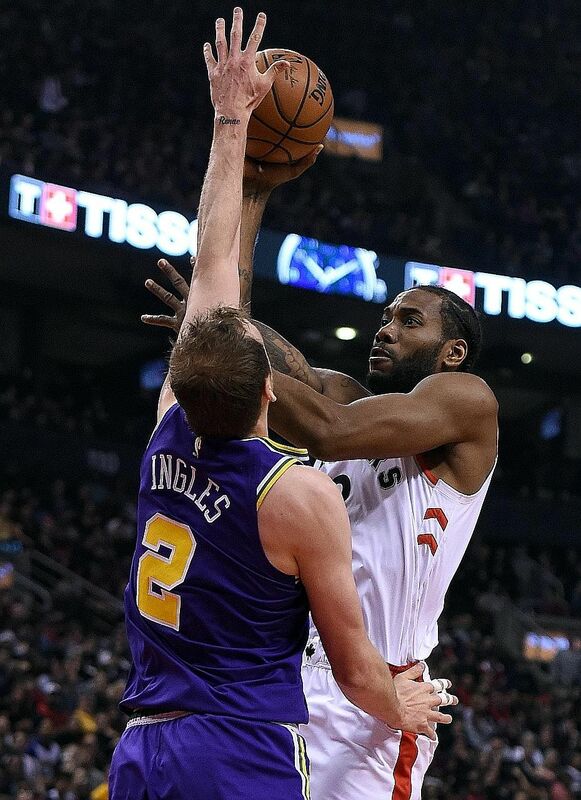 In their absence, Leonard excelled, making all seven of his field-goal attempts in the third quarter as he scored 19 points in the period and the Raptors - who trailed by two at half-time - pulled away. After making just two three-pointers in the first half, the Raptors connected on their first three from beyond the arc in the third to seize control of the contest. They took a 10-point lead into the fourth quarter and, while the Jazz managed to cut the deficit to as few as four, they could not get any closer. Utah have now lost for the third time in five games. "He was phenomenal," Raptors coach Nick Nurse said of Leonard. "Kind of been waiting for one of these nights where he makes them all. He was great and he's a special, special player, as we know. That's good that we all got to witness that live and in person." Jae Crowder scored a season-best 30 points for the Jazz (18-20) in the first of a four-game road trip. Derrick Favors added 21 points and nine rebounds while Donovan Mitchell notched 19 points. "When a guy (like Leonard) gets going, it's hard to stop him," said Mitchell, who was held to 7-for-23 shooting.